The most important celebration in Vietnamese culture is Tet, or Vietnamese New Year. The word is a shortened form of Tết Nguyên Đán meaning “Feast of the First Morning of the First Day”. The holiday is an occasion in which people dress in new fancy clothes and reinvent themselves. They get new haircuts, earrings, shoes, accessories. Parents and relatives also give money to and buy stuff for children. Tet’s timing is based on the Vietnamese lunar calendar and usually falls in January or February. When we set out on this trip we tried to be disciplined about what we brought along with us. Some advice we received was to pack half of what we think we’ll need and bring twice as much money. 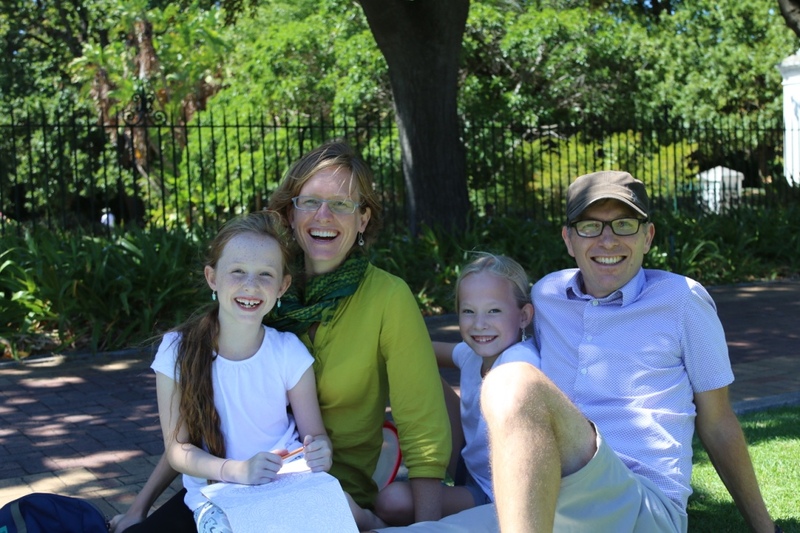 After researching other travellers’ packing lists, we made an inventory of everything we would bring. Anything that wasn’t on that list didn’t make it into our packs. As an example, here’s a shot of Nigel’s clothing for the full eight months. Missing from the pile are shoes, two shirts and a pair of shorts. 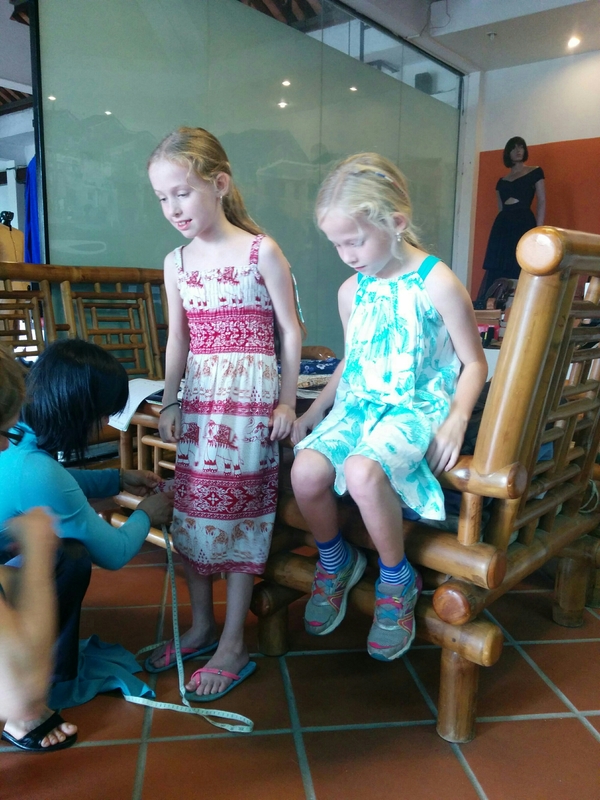 We knew that we could pick up most things we needed along the way and that Da Nang would be the place to do so. 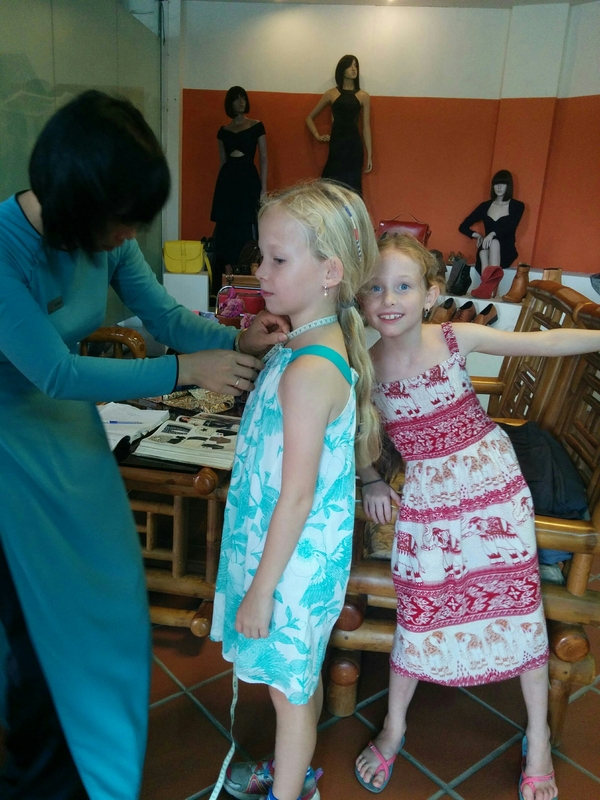 Da Nang is 20km from Hoi An, a town full of bespoke tailors who can create any article of clothing that one could desire. Hoi An tailors enjoy a reputation as master craftsmen, able to copy any design they see, based on a picture, within 24-48 hours. We could use more clothes. We have enough clothing to make it through a four-day period. 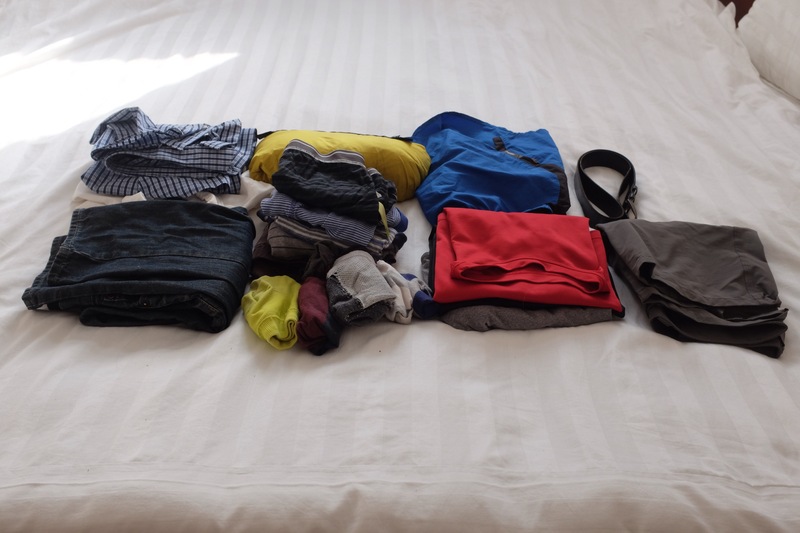 Four days are fine if we have a washing machine but if we’re cycling through hotels and cities, it’s better to have extra shirts, dresses or shorts. Off we went to Hoi An yesterday. It took us 90 minutes to choose material and get sized. We either left our clothes as design examples or the tailor sketched out the designs. None of us has ever had custom clothing made, so it’s a sweet indulgence. And, Saga can ask for improvements on the design of the dress that she is getting: her current dress is too tight around her ankles and she hasn’t been able to skip and jump as much as she needs to. Louise and Nigel could use new eyewear. Our lenses are scratched and our frames are old. Not surprisingly, Da Nang also boasts top notch opticians. We went to a family run place operated by a father/ 2 sons team: Viet (son) Nam (father) and Ho (other son). Easy to remember. We’ve had glasses made for us in 48 hours. One of us has an unusual prescription and the optician needed to get a lens shipped from Hanoi. So Tet came early for us. New fancy clothes, earrings for the girls (look at Ida’s and Saga’s ears above), and accessories for the parents. Now we just need to find a barber! We so love getting these posts. It is the highlight of our mornings. : ) Looks like you are having a wonderful time. Thinking of you and hope Nigel is well on the road to recovery. ‎ Please give our love to the girls!